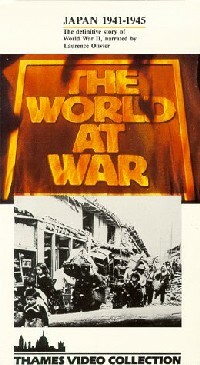 Many consider The World at War, which Britain's ITV television network first aired weekly from October 1973 to May 1974, to be the definitive World War II documentary series. The powerful visual images, numerous interviews with participants on both sides, and well-researched narrative earned this documentary many accolades. The renowned actor Sir Lawrence Olivier narrates the history in an evenhanded manner by giving the views of each side. The 26 one-hour videos encompass the entire scope of the war, but only five of them cover the war with Japan. Kamikaze attacks receive little attention, with two videos having only a three-minute segment each. Volume 22, Japan: 1941-1945, contains several vivid images of kamikaze planes that either hit ships or fell flaming into the sea. However, the narrative on kamikaze attacks provides only a limited history with few details. The documentary gives a distorted view of the timing of the attacks, with the implication in the narrative being that most of them occurred right before the Allied invasion of Okinawa on April 1, 1945. No reference is made to the extensive kamikaze attacks in the Philippines from October 1944 to January 1945. Also, the video does not explain that more than half of Japan's kamikaze attacks took place after April 1, 1945. This volume does contain a tragic story told by a U.S. Navy lieutenant, who tells of a gunner who reached his breaking point after his area had been hit two or three times by kamikazes. He yelled, "It's hot today," and then jumped overboard, never to be found. The World at War deserves its many honors for excellence as a visual documentary of World War II. On the topic of Japan's kamikaze operations, the documentary series has a couple of interesting interviews with a Japanese commander and an American soldier directly involved in the action. However, the documentary's short sections on kamikaze attacks do not contain enough details to allow a real understanding of the feelings of the pilots and the reasons for the Japanese military's use of suicide attacks.